While you're planning your Christmas dinner, this is a good time to take a stroll through your storage fruits and vegetables and see how they're doing. I'm sure you've heard that a rotten apple can spoil the barrel --- time to catch those rotten apples before they have a chance. 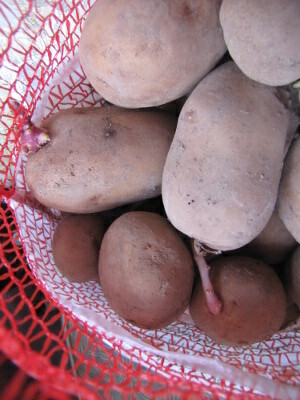 We tried out two different methods of storing our white potatoes this year --- under my bed and in the fridge. Neither is optimal, but with just a few vegetables prefering root cellar conditions, we didn't think it was worth adding to our busy fall by fixing the refrigerator root cellar. Over the last month or so, I noticed that the under-the-bed potatoes were starting to sprout, while those in the fridge were still hard as rocks, but my most recent foray into under-the-bed tubers shows dark spots popping up in their flesh. I suspect that last week's serious cold spell froze the tubers touching the floor, cutting their shelf life down and putting them into the "eat now" category. Still, keeping potatoes for 5 months with no special storage facilities isn't bad at all. Next up, I'll be checking over the sweet potatoes, garlic, and butternuts. I've noticed that a few of the butternuts have rotten spots --- probably time to roast them up and freeze the flesh for later eating now that there's a bit of space opened up in the freezer. A little bit of management every month tends to keep us eating fresh food all winter, and I get a kick out of checking over our produce and seeing how much bounty remains after the solstice. Give your chickens the gift of clean water with our homemade chicken waterer.